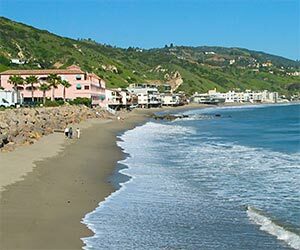 Malibu Beaches - There are twenty-four beaches in Malibu, and most of them are north of the Cross Creek area in eastern Malibu. This list includes only the beaches that are of significance to tourists. Oceanside Restaurants in Malibu - Restaurants overlooking the ocean, on or next to the water. The list is in order from south to north, with restaurants closest to Santa Monica listed first. Malibu Wineries and Vineyards - Malibu's location at the foot of the Santa Monica Mountains, and proximity to metropolitan Los Angeles makes it an ideal place for vineyards and wineries. Several of the wineries have tasting rooms, and some offer tours and outdoor activities in the mountains. Museums in Malibu - including Getty Villa, Adamson House and Malibu Lagoon Museum, Surf Museum at Payson Library (Pepperdine), Frederick R Weisman Museum of Art (Pepperdine), as well as museums in Santa Monica and the South Bay. The section of Pacific Coast Highway near Malibu Canyon Road is home to many of Malibu's attractions. 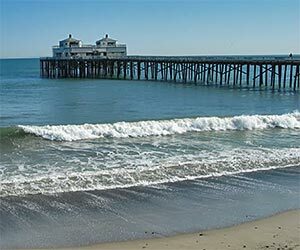 Malibu Pier - This is a landing page for a variety of attractions at the Malibu Pier, including restaurants, tours, beach rentals, fishing information and more. Malibu Pier at Malibu Lagoon State Beach - This is the page for Malibu Pier on the State Park's website. It offers a description of attractions on and near the Malibu Pier. Malibu Discovery - Guided bus tours and guided hiking tours originating from the Malibu area. Tours include the Malibu Wine Trail Tour, Brunch and Wine Tasting Tour, Twilight Wine and Dine Tour, Malibu Celebrity and Movie Set Tour, Deluxe Sightseeing Tour, Sunrise Hiking Tour, and Ronald Reagan Library Tour. Malibu Farmers Market - Sunday 10 AM to 3 PM, in the parking lot of the Malibu Library. Malibu Lumber Yard - Contains 18 shopping and dining establishments such as Kitson, Kitson Kids, J. Crew, Canyon Beachwear, the Malibu Art Barn and more. The outdoor mall features a huge fish aquarium in the common area. Malibu Bluffs Community Park - Located at the intersection of Pacific Coast Highway and Malibu Canyon Road, overlooking the Pacific Ocean. The park features baseball diamonds, a soccer/multi-purpose field, a playground suitable for ages 2-12, a jogging path, picnic tables, a whale watching station and the Michael Landon Community Center. Free wireless internet access (wi-fi) is available. Hiking and Driving in the Santa Monica Mountains on Malibu Canyon Road - if you drive on Malibu Canyon Road, past Pepperdine and into the Santa Monica Mountains you will find Tapia County Park (parking fee) where you can hike on the Backbone Trail. A little further up is Malibu Creek State Park (parking fee), where you can hike to the old M*A*S*H filming location. Not far from Malibu Creek State Park you will find Mulholland Highway, which stretches through the Santa Monica Mountains from Pacific Coast Highway to the San Fernando Valley. Malibu Colony is a private, gated community where some celebrities have mansions. The Malibu Colony neighborhood (map) is located off of Malibu Road between Malibu Pier and Malibu Bluffs Community Park. Malibu Road connects to Pacific Coast Highway in two places near, one of them near Cross Creek Road. Pepperdine University's Center for the Arts - Music Concerts, Comedy, Theatre, Stage Performances and Facility Rental. Malibu Playhouse - Theatrical productions and fundraising events, including plays, music, stage shows, celebrities, etc. Malibu Film Festival - The Malibu Film Festival is a showcase for independent filmmakers. Various genres and types of movies are presented. Malibu Arts Festival - Artisans display hand-crafted goods for sale. There are also food trucks and booths. Occurs once each year, on a weekend during the summer. Most tours do not go to Malibu, because it's isolated from the rest of Los Angeles. A taxi cab ride is expensive, even from Santa Monica. A rental car is your easiest option. From Santa Monica and most parts of metropolitan Los Angeles, the quickest route is to drive on I-10 freeway west, all the way to the end, where it becomes Pacific Coast Highway (no need to exit, but you have to slow down to go around a curve and through an underpass). Malibu Pier is about 12 miles from the I-10 terminus, and about 7 miles from Sunset Boulevard. From the San Fernando Valley, either take I-405 South to the I-10 West and follow the route described above; or from the West Valley area take Topanga Canyon Road to Pacific Coast Highway. Using public transportation to get to Malibu is easy if you are only going as far north as the Getty (it's only a half mile north from Sunset Boulevard). Bus options to points north of there might be limited in terms of frequency and stops. Metro's website is the best source of information for schedules and routes. Malibu City Hall - 23815 Stuart Ranch Road Malibu CA 90265. Malibu Chamber of Commerce - 23805 Stuart Ranch Road Malibu CA 90265. 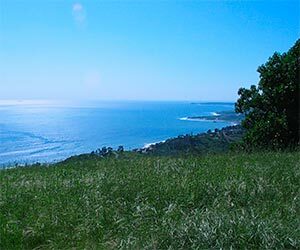 Malibu Beaches, Parks and Attractions from the City of Malibu's website. Beach Facts, Beach Bus Information (to/from Agoura, Calabasas and Moorpark), a list of L.A. County Beaches and Harbors, a list of State Beaches in Malibu, and a list of parks in Malibu. There is also information about the Monterey Bay Aquarium White Shark Research Project, which is a shark pen located off the coast of Malibu.